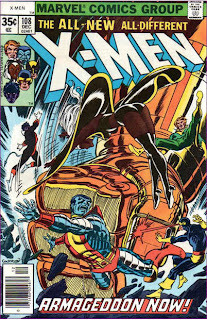 Psylocke guest stars in this issue, picking up where X-Men #12 left off, and Captain Britain shares with her his concerns about his increasing tendency to resort to violence as a first resort when faced with a problem. This also marks the first time Alan Davis draws Asian Psylocke. 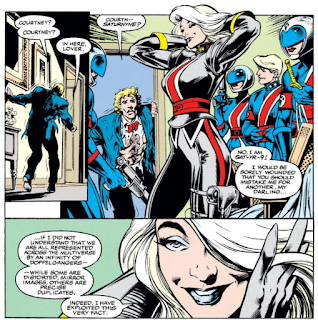 Captain Britain (and the rest of Excalibur) finally learn that the Courtney Ross they've been interacting with since issue #5 is actually Sat-yr-9, the evil alternate dimension counterpart of Saturnyne (this is also the "Courney Ross" who befriended and mentored Kitty when she returned to Earth sans the rest of the team towards the end of the "The Cross-Time Caper", up through "Girls School from Heck"). 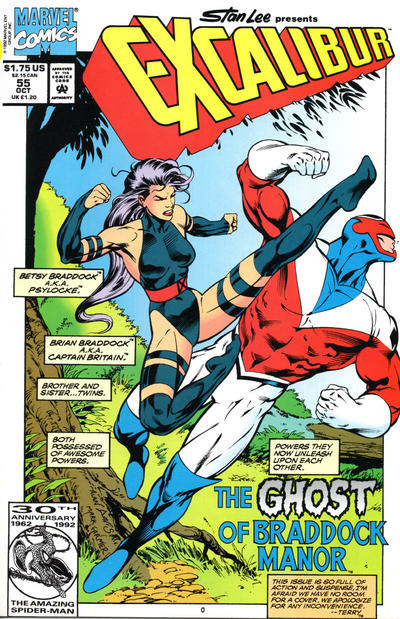 Jamie Braddock, Captain Britain & Psylocke's deranged older brother with reality warping powers, last seen in issue #27, also returns this issue, and attacks Excalibur in conjunction with Sat-yr-9 (with whom he is allied via Nigel Frobisher, who also appears in this issue as "Courtney's" date to the party). 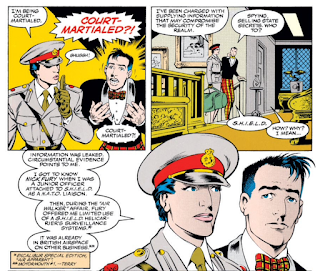 Brigadier Alysande Stuart, head of WHO and Alistair's sister, dies this issue, killed by Jamie Braddock. 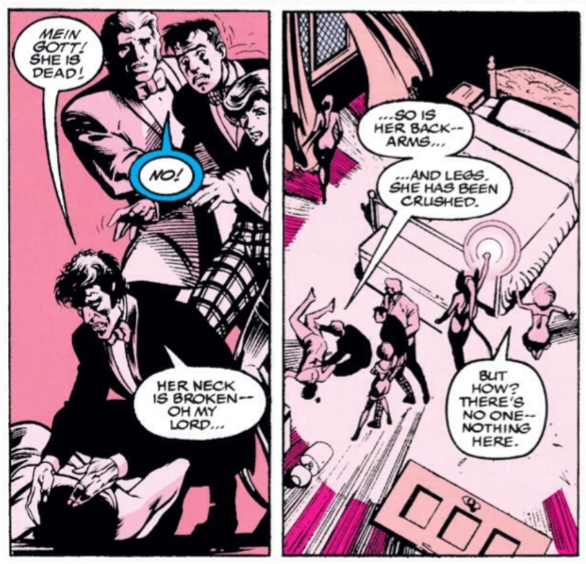 Surprsingly, she had remained dead; this is her last appearance (though for some reason, she's referred to as "Alysdane" throughout this issue). Kylun leaves this issue to reconnect with his family; he'll return in issue #63. The cover of this issue is laid out like an internal page, with a note saying the story is so big, it needs every possible page. 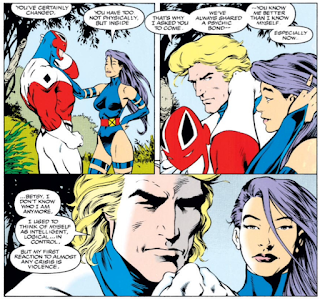 Captain Britain references a psychic bond with Psylocke; I'm not sure if this is meant in a more general "twins can have eerie psychic powers with each other" kind of way, or if the pair has a previously-established, legitimate within the confines of a world with actual psychic powers, kind of psychic bond. 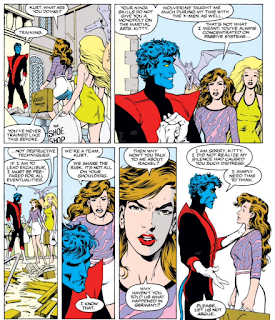 Nightcrawler is practicing hand-to-hand combat, albeit a more aggressive style than usual, something he says is necessary if he's going to lead Excalibur. He's also apparently not talking about the events of Marvel Comics Presents #101-108, either. Inspector Dai Thomas and Emelia Witherspoon, the psychic who was working with Scotland Yard is issue #44, are attending the party as well. 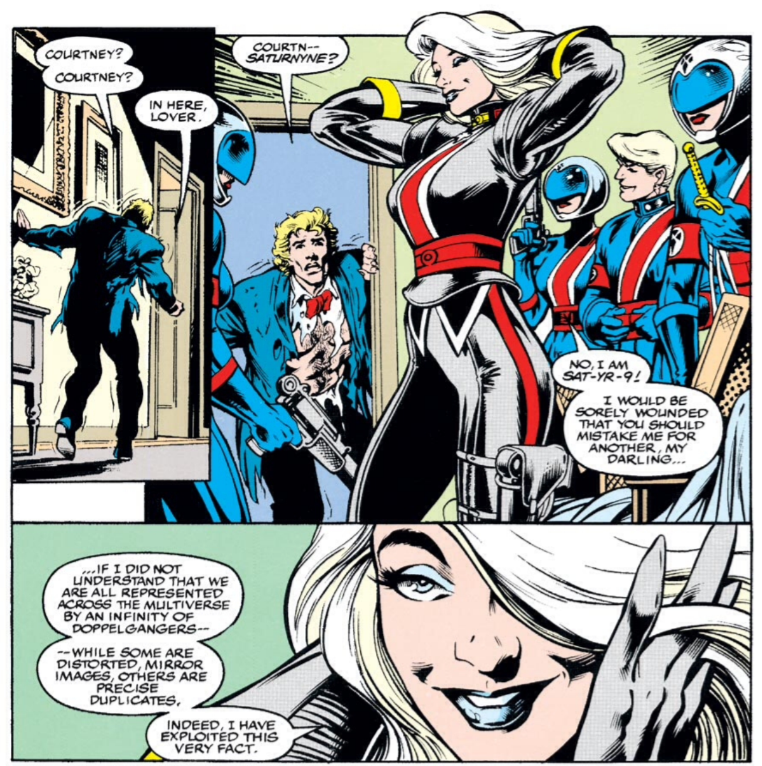 Prior to her death, it's revealed that Alysande us being court-martialed (which seems like an attempt by Davis to show why Alysande briefed Excalibur aboard a helicarrier in Air Apparent). Her defense of Muir Island against the Readers in Uncanny X-Men #253-255 is also referenced. 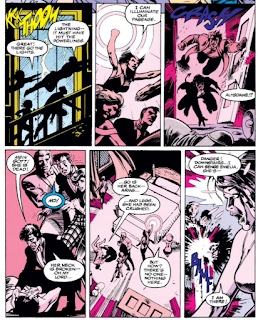 For some reason, when Excalibur hears Alysande scream from upstairs, Nightcrawler runs up the stairs along with everyone else, but later, when his attention is drawn back downstairs, he teleports there. Given the scream, it seems like he probably should have least teleported to just outside her door rather than running with everyone else. Widget appears briefly in the midst of Jamie and Sat-yr-9's attack on Excalibur. When "Courney" arrives at Braddock Manor, she greets Brian with a big kiss. Which prompts a similar response from Meggan. 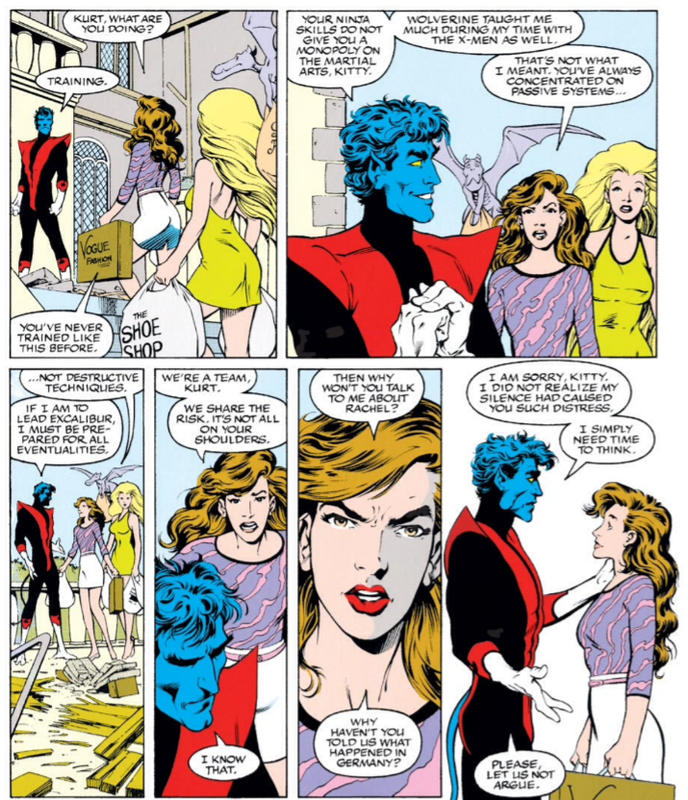 This, in turn, prompts Cerise to kiss Nightcrawler, which more or less marks the beginning of their relationship. Whether intentional or not, there are shades of the opening of the middle act of "The Dark Phoenix Saga" all over this issue: the heroes engaging in a fancy dress party at a mansion, the looming sense of menace, everyone getting picked off one-by-one by unseen assailants, someone the heroes thought was a friend is revealed to be attacking them, one lone hero is left standing (and it's Wolverine trainee Kitty Pryde) and one of the villains is revealed to be a massively-powered individual with a personal tie to the heroes. After several issues of loose-end-typing, fill-in and standalone stories, this is a welcome return to a more traditional superhero narrative (though this is still also all about tying up loose threads, in this case, the long-simmering Sat-yr-9/Jamie Braddock subplot), but Davis is careful not to abandon the book's emphasis on characterization, keeping that in the forefront as the threat builds in background. Just great, great stuff. Tomorrow, more Weapon X fun in Wolverine #62. Next week, Cap-Wolf. 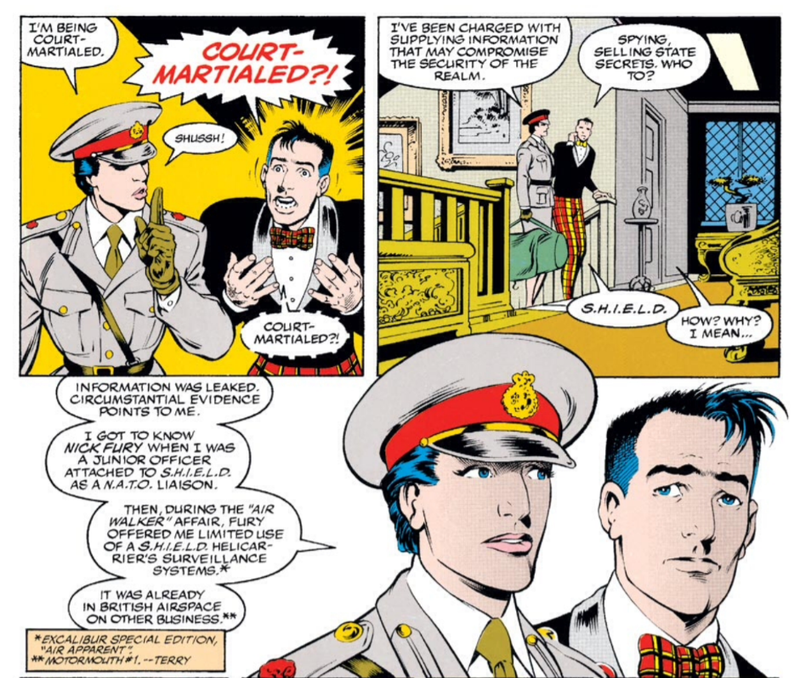 Am I the only one who thinks that the whole idea of Psylocke going from British to Asian is ridiculous? I know that she became far more popular after the transformation, but it still makes no sense. It would have been better had they created the Asian ninja type as a new character. I agree the transformation is totally arbitrary. Claremont could've simply had the already existing Psylocke trained as a ninja by the Hand if that was what he really wanted. The change in bodies is just weird. That said, I like Asian Psylocke. This is what she looked like when I first encountered the character, and so in my mind this is the definitive Psylocke. I sometimes feel like I'm in the minority there though, at least among the online X-Men fandom. You're right. He should have given her ninja training, or created a new character. 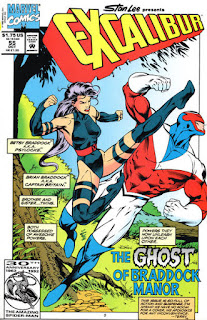 I actually preferred her as the Outback Psylocke, maybe because I began reading comics at that time (Brazil was two years behind the US; I was following the Outback era in Portuguese and the Jim Lee blue team in English, since my older brother bought both). @Licinio: Nah, plenty of people don't like Asian Psylocke. It gets routinely mocked online, and is often held up as an example of one of the worst of Claremont's tics. @Matt: You're not alone, either, as I like Asian Psylocke too, mostly because, like you, that's the version of the character I was introduced to as well (I've since come to appreciate British Psylocke as well, and agree there were better ways to develop the character without going the body change route, but it is what it is, and it doesn't bother me much). I love this issue; it's one of my favorites from Davis's run -- and this two-parter is the last of the run that really enjoy with no reservations. His final big story arc, coming up after even more fill-ins, just doesn't do a lot for me. Speaking of Psylocke, Davis may well be the first artist to actually draw her with Asian facial features. Her transformation is not something he liked, but he's always drawn her very well in that form. Indeed. When you compare the way he drew her as British and how he draws her as Asian, you can see that he did his job. I like this issue for its sense of dread and its nice character moments, but on a larger level it's always kind of bothered me. The off-hand, undignified death of Alysande was not what her character deserved. And while I appreciate Davis tying up loose ends, this two-parter has always felt like an awfully small and somewhat anticlimactic end for the long-simmering Sat-yr-9 and Jamie plots. 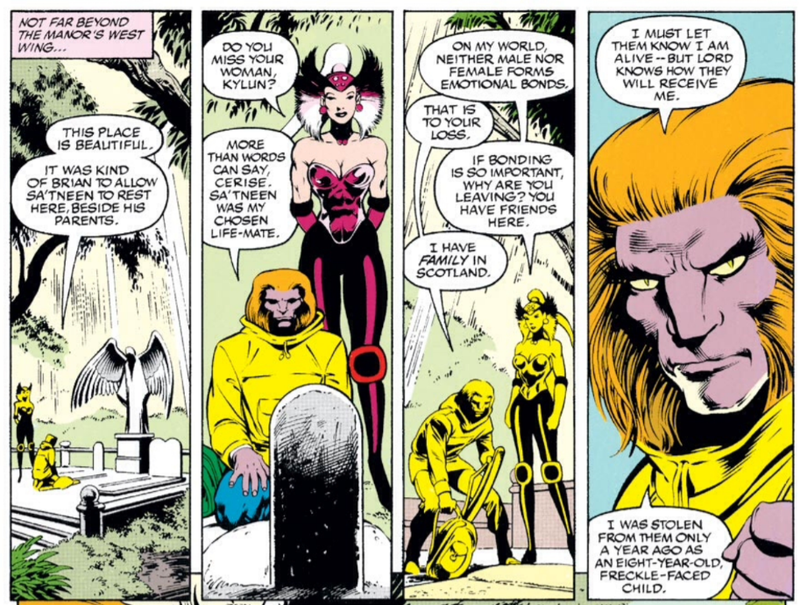 "Her defense of Muir Island against the READERS in Uncanny X-Men #253-255 is also referenced." Yeah, this issue is awesome. I was way late to the party for it. I think it was 2010 when I finally read the Davis/Davis run for the first time. This two-parter is especially good, Davis at the peak of his powers as a writer/artist. I was legit shocked by Alysande’s death — and to find here that it’s unfortunately not a plot feint but actually holds. Huh. I didn’t know they had a relationship. I did get a kick out of the clock behind them ticking away, even if everyone standing around staring at them doesn’t really jibe with how much time it has elapsing.